The Juanjamon Band is a funky show band featuring music from one man's heart, mind, soul and influences from across the Universe. Being predominantly known as a saxophone player, Juan "Juanjamon" Montero started this group as an arena to play bass, feeling that an unspoken form of musical control can be a more effective way of improvising and experimenting live. 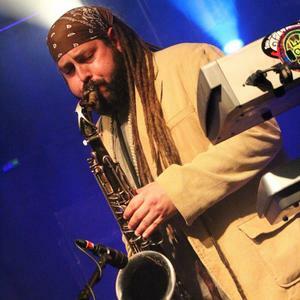 Charming any crowd into a good time, The Juanjamon Band plays catchy Parliament and New Orleans based Funk while mixing in influences from Jimi Hendrix, Bootsy Collins, Bob & Damian Marley, Maceo Parker, Karl Denson and the late great Michael Brecker. Let's Dance!